This unique instrument presents multiple advantages for the routine histology laboratory. It serves to avoid the complicated and time-consuming melting of paraffin using Bunsen burners, incubators or pots and helps saving space in the laboratory. As the special filter cartridge retains all residues, even old blocks can be melted down. Adding the same quantity of fresh paraffin, the obtained filtered paraffin can be used again without any remarkable loss of quality. 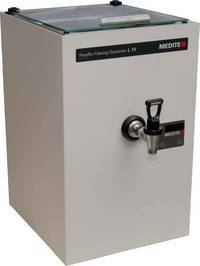 The large working space below the safety spigot enables easy paraffin dispensing.